Is Deckard a Replicant? Is this new blend really Black Label? I remember the first time I watched Ridley Scott’s Blade Runner. It was a VHS of the 1992 Director’s Cut I rented from Blockbuster. VHS? Blockbuster? Damn, I feel old. After watching this Harrison Ford sci-fi flick, I didn’t like it. It definitely wasn’t what I expected at the time I watched. As a teenager expecting some sort of big action flick, I felt disappointed. I thought it was quite boring. It wasn’t until about a decade later that I decided to revisit the film. The film’s overarching theme questioning the definition of humanity finally held my attention and curiosity. The production design and cinematography was pure eye candy upon this fresh viewing of the film. Ford’s nuanced performance as the Replicant-hunting Deckard captivated me in a way that, like most viewers before me, left me questioning whether the character was human or Replicant. The film quickly became a favorite. In a parallel story that began unfolding when I reached drinking age, my first foray with Scotch whisky was not a good one. The drink was a Johnnie Walker Black with water. Ignorance and inexperience literally left me with a bad taste in my mouth. I even caught a glimpse of the bartender smirk a little after she saw the face I made after my first sip. This didn’t taste like bourbon. And what the hell was this smoke doing in my whisky? Again, ignorance and inexperience. Thankfully tastes change as one ages. Once I started getting serious about whiskey, I came back to Mr. Walker. This time around I appreciated Black Label’s many subtle complexities, from the creamy vanilla brought on by the grain whiskies to the silky smoke fired up by Island malts. It was a trip to Scotland in a glass. Blade Runner 2049, the sequel to the original film, opens in theatres this Friday. At the same time, a new whisky – Johnnie Walker Black Director’s Cut – was announced. Just another movie tie-in, right? Wrong. 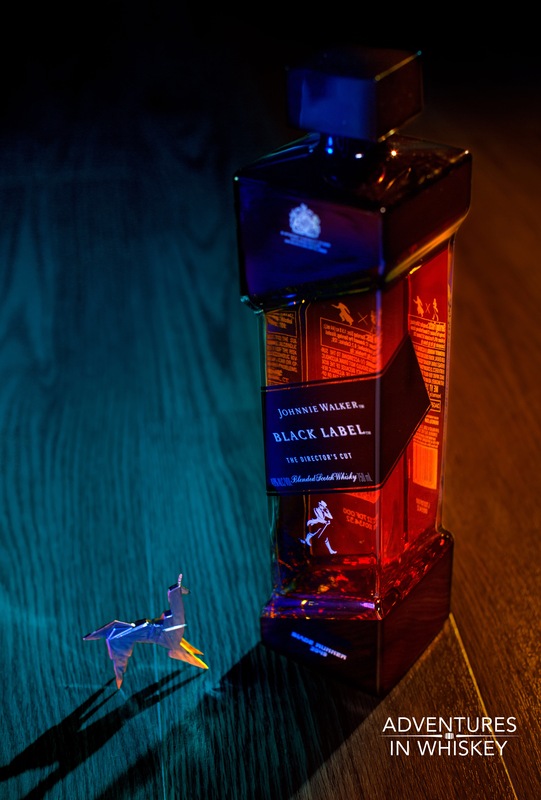 Johnnie Walker Black Label was featured in Blade Runner as the whisky consumed by several characters. The bottle was even designed to look futuristic. So when the chance to appear in the new film presented itself, Johnnie Walker did more than just bottle the same whisky in a redesigned bottle. They blended a new Black Label whisky. Director Denis Villeneuve and Master Blender Jim Beveridge collaborated on a new Johnnie Walker blend in the style of the famous Black Label, with a few changes and tweaks. The limited edition whisky is bottled at 49% abv, a nod to the year the new film takes place. More than 30 whiskies are used in the blend. I find familiarity in the nose. Black Label DNA, for sure. Slightly creamy vanilla-tinged grain whisky, light toffee, and a touch of orchard fruit play along wisps of smoke. That last bit is slightly more prevalent here than in the standard Black Label and nowhere approaching the high levels found in Double Black. More of the same on the palate: toffee, vanilla, orchard fruits, light oak spice and citrus zest all enveloped in light smoke. Some dried figs show up in the mid-palate alongside the slightest hint of leather. The higher ABV makes the whisky a bit bolder in character, but easily drinkable to those used to the low 40% abv of Johnnie Walker Black. It also expands the finish, leaving behind hints of salted caramel and very light smoke. Johnnie Walker Black Label Director’s Cut does a great job of paying homage to the original blend by building a similar whisky but with enough of a modern upgrade to keep things interesting for JW fans. One shouldn’t turn their nose up at this whisky’s lack of age statement. That would be a mistake. Now, if you absolutely can’t stand the standard Black Label, skip this release. Director’s Cut is similiar enough in flavor profile, but elevated in tasting experience thanks in part to the higher ABV. Higher proof Johnnie Walkers can be dreamy (I still need to taste Blue Label Casks Edition).